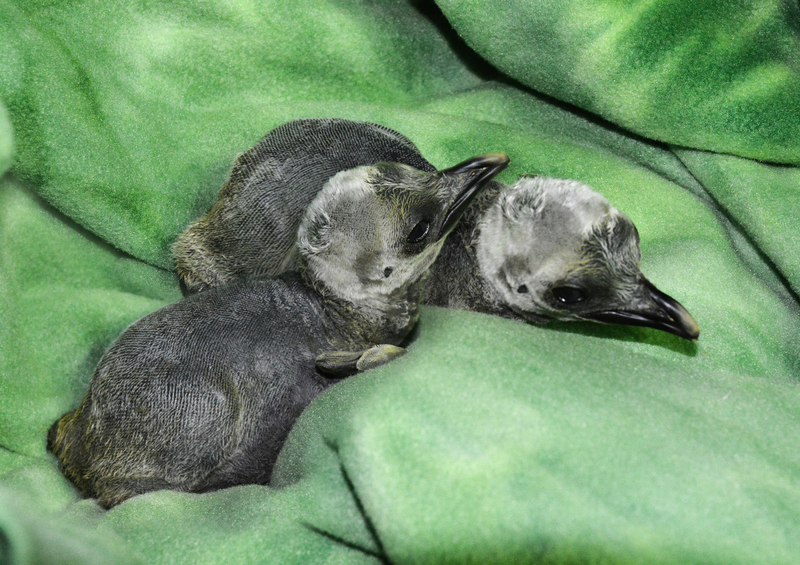 NEWPORT, Ky. – Newport Aquarium announced Thursday two king penguin chicks hatched inside the Kroger Penguin Palooza exhibit over the weekend. The two chicks, which are not of relation, simultaneously began to pip Friday evening before fully hatching Saturday morning. The newborns shared an April 4 egg-laying date. Each chick weighed approximately one-half of a pound during their initial medical examinations, appearing roughly the size of a baseball. Each king penguin chick has a father and a mother. The first chick’s parents are Bebe (father) and Wednesday (mother). Before it hatched, the second chick was moved to foster parents Bubba (father) and Valentine (mother), who are more seasoned parents compared to biological parents, Kroger (father) and Dumas (mother). Guests can catch a glimpse of the chicks inside the Kroger Penguin Palooza exhibit as the parents of the chicks share rearing duties. 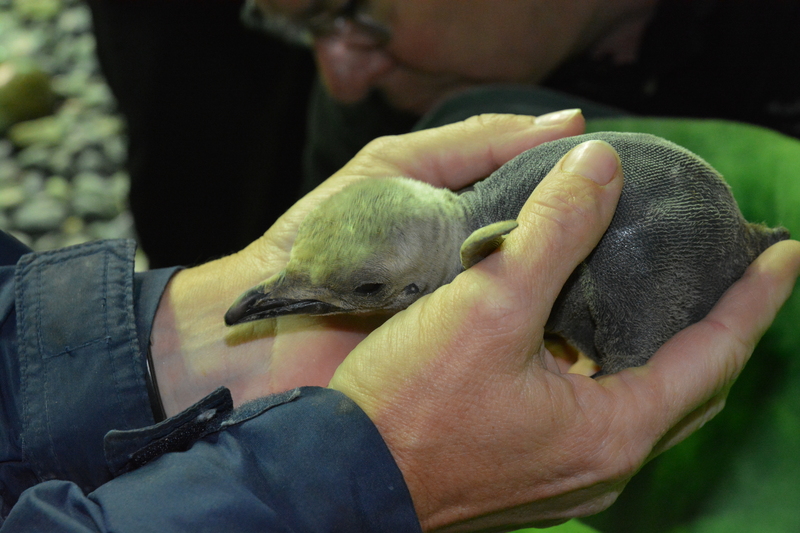 One of the two newborn birds is a third-generation king penguin hatched at Newport Aquarium. Its mother, the aforementioned Wednesday, was the last king penguin hatched at the aquarium in 2010, before the cold penguin exhibit was renovated and reopened as Kroger Penguin Palooza in March 2011. Newport Aquarium is one of only 16 institutions in the United States to exhibit king penguins, the second largest species of penguin in the world with adults growing to more than three feet in height. The simultaneous births of two unrelated king penguins is a rarity. 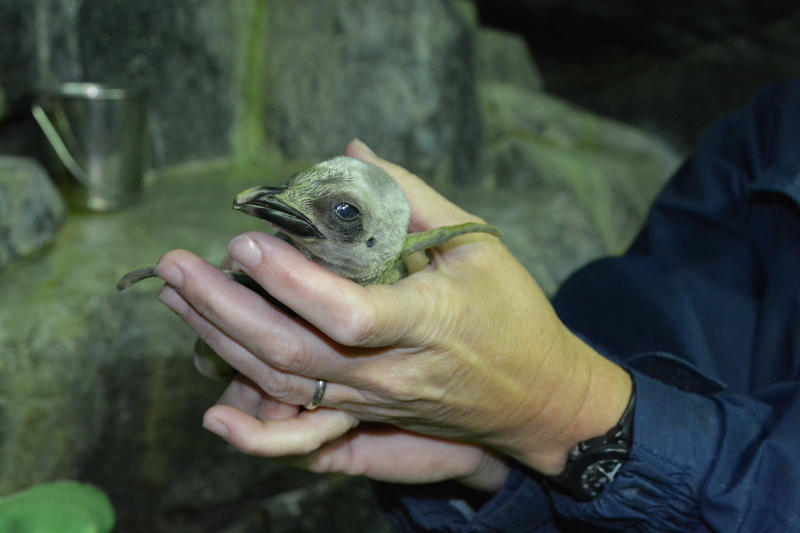 Over the last 10 years at Association of Zoos and Aquariums institutions in the U.S., there has been an average of only 14 king penguin hatchings annually. Newport Aquarium has exhibited king penguins since the Northern Kentucky attraction first opened to the public in May 1999, originally exhibiting king penguins acquired from Adventure World near Shirahama, Japan. Kroger Penguin Palooza features 49 birds that form one of the most diverse collection of penguins in the country. In addition to the two chicks, there are nine adult king penguins, as well as chinstrap, gentoo, macaroni and rockhopper penguins. A sixth penguin species, the African black-footed penguin, is also on exhibit at Newport Aquarium in the Penguin House. The public will have an opportunity to name the two king penguin chicks via the Newport Aquarium Facebook page beginning Friday. With their fluffy brown appearance, king penguin chicks look so dissimilar to adult king penguins that early explorers described them as an entirely different species, the woolly penguin. King penguins are one of the few birds that do not build nests. Instead, they incubate their eggs under the belly on top of their feet. King penguins can be found in the waters of the sub-Antarctic. They breed on many of the sub-Antarctic islands, such as South Georgia, Crozet, the Falklands, and the islands southeast of Australia and southwest of New Zealand. Newport Aquarium, the No. 1 aquarium in the country according to USA Today’s 10Best.com, has showcased thousands of animals from around the world in a million gallons of water since 1999. Named a top U.S. aquarium by US City Traveler in 2014 and by Travel Channel in 2013, Newport Aquarium is a Herschend Family Entertainment company and an accredited member of the Association of Zoos and Aquariums. Newport Aquarium is open to the public 365 days a year and is located across the Ohio River from downtown Cincinnati at Newport on the Levee. This entry was posted in King Penguin Babies and tagged babies, birds, hatch, king penguins, penguins, pip by NewportAquarium. Bookmark the permalink.